A gorgeous new design coupled with powerful specs. It's been only six months since the launch of the OnePlus 5T, but today the company is pushing out a new device that both packs the latest top specs and manages to one-up its earlier design. As you probably saw a little earlier, the new OnePlus 6 is yet another flagship that stuffs plenty of processing power into an elegant package, with its slogan promising to deliver "the speed you need." 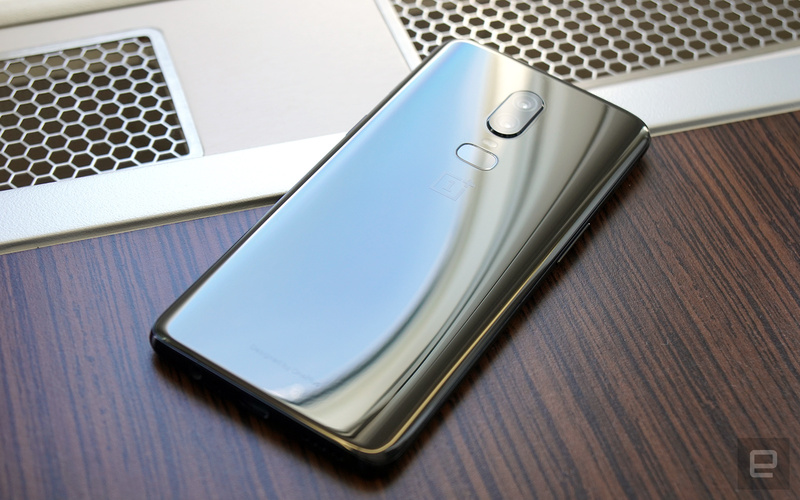 It also happens to be OnePlus' most expensive phone to date, with a base price starting at $529 to make up for the extra work put into its gorgeous glass design. From afar, this new device is unmistakably OnePlus. Save for the dual cameras that are now sensibly centered on its back, the OnePlus 6 feels almost identical to the 5T. The rounded edges and subtle curvatures are further highlighted on the Mirror Black edition, with its surprisingly convincing ceramic look, courtesy of a five-layer coating on the Gorilla Glass 5 panel plus some extra polishing on the metallic frame. In fact, when I place it side by side with my actually ceramic Xiaomi Mi Mix 2, the OnePlus 6 makes that phone look dull. And its curves ensure that the material finish really shines. 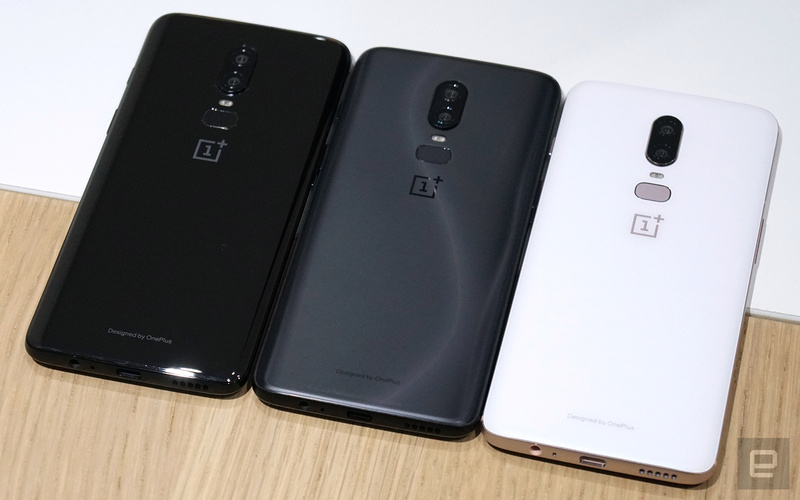 That said, if you can't stand fingerprint smudges, then you may want to consider the other two flavors of the OnePlus 6. Both Midnight Black and Silk White feature a matte finish, which apparently is achieved with a corrosion process similar to the one applied to Apple's glass trackpads. The result is a silky smooth finish -- almost like the "baby skin" feel on the legendary OnePlus One. The company then took it a step further by adding some visual tricks. By embedding a thin textured film below the glass, the Midnight Black shows off an S-shaped line along the back when viewed from a certain angle. The Silk White is even more bonkers, with pearl powder -- yes, pearl powder -- sprinkled underneath the glass, which gives off a subtle shimmering effect when you play around with the device. I probably wouldn't even mind the rose gold frame on the white option. OnePlus continues to deliver a stunning AMOLED display, now stretched to a 19:9 ratio (at 6.28 inches) as it goes all the way to the top. The trade-off here is the small notch, but that's been growing on me -- it's just nice to have that extra screen real estate inside a phone that's the same size as the 5T. I can expand the screen even further by replacing the Android navigation bar with gesture controls. They may sound familiar: Swipe up from the center of the chin to go home, swipe up and hold to see recent apps, and swipe up from either the left or the right side to go back. iPhone X users will already be familiar with some of these gestures, and likewise for those who have already been trying out the Android P beta. While the screen's 2,280 x 1,080 resolution isn't the Quad HD+ (2,880 x 1,440) upgrade that I was hoping for, this is still plenty, given the overall display quality. Besides, this also gives OnePlus some leeway to keep its OxygenOS (based on Android 8.1) super snappy, and so far the phone certainly runs incredibly smoothly in general. Another notable -- but less obvious -- upgrade is the 16-megapixel f/1.7 main camera, which now sports slightly larger pixels for better low-light performance, along with optical image stabilization (at last!) to reduce blur. The challenge will be whether these spec bumps transfer to better photos -- a weak point for previous OnePlus phones. I'll be taking a closer look when I review the new flagship. For video, the OnePlus 6 can shoot 4K at up to 60fps -- doubling the frame rates on the two earlier models -- while still supporting electronic image stabilization, along with super slow motion at 480fps in 720p or at 240fps in 1080p. OnePlus' unique tri-state alert slider has moved to the right side -- although I'm not sure why. It now toggles between Ring, Vibrate (instead of Do Not Disturb) and Silent. You'll also find the same built-in 3,300mAh battery, which is backed by OnePlus' Dash Charge technology, although, oddly enough, the company decided not to add wireless charging under the glass back, so that's one feature you'll find only on pricier flagship phones. Oh, and about those new OnePlus earbuds: The Bullets Wireless' magnetic trick did a good job of keeping the wires from tangling up during my brief hands-on time with it. I wish there were a way to adjust the length of the cables so I could put the remote control in a more accessible spot, though. It hangs right by my jaw, and when reaching up for it I almost always knock the earbud out of my ear. I enjoyed wearing it as a faux necklace for a bit, and it's certainly not a bad-looking accessory. Having said all that, gorgeous design aside, the rest of the phone is a relatively standard affair. On top of the Snapdragon 845 processor, which has proven to be quite the beast in other recent smartphones, you get to choose a combination of 6GB of RAM with 64GB of storage ($529/£469/€519, Mirror Black only), 8GB of RAM with 128GB of storage ($579/£519/€569, all three editions) or 8GB of RAM with 256GB of storage ($629/£569/€619, Midnight Black only). The OnePlus 6 may not be the same bargain that the series used to offer, but very few competitors carry such features and specs at these prices. This is the most premium smartphone OnePlus has made, by a big margin. You'll be able to grab a unit starting May 22nd, with the limited-edition Silk White to follow on June 5th. I'm completely in love with the OnePlus 6's design. New features on the software side are a little light, but at least OnePlus chose not to waste effort on AI gimmicks. Instead it's focused on making a phone that can realistically go toe-to-toe with devices that are hundreds of dollars more expensive.